How to change the old cold storage for fish into new urban functions without destroying an icon in the cityscape? In 1954 the new plant for Bergen Fiskeindustri AS stood ready for use as one of the most modern freezer and cold storages of the time in Europe. The facility has had great significance for the management and availability of fish and other foodstuffs on the West Coast. It was the renowned Bergen architect Per Grieg who was responsible for the design of this contemporary functionalist industrial plant. The area today bears strong traces after longstanding fishing and offshore related industries with large wharf areas in asphalt and concrete and a visually complex building mass of varying quality. The present proposal for transformation of Bontelabo is of such a nature that the area in the future will emerge as more accessible, attractive and with greater activity at street level. 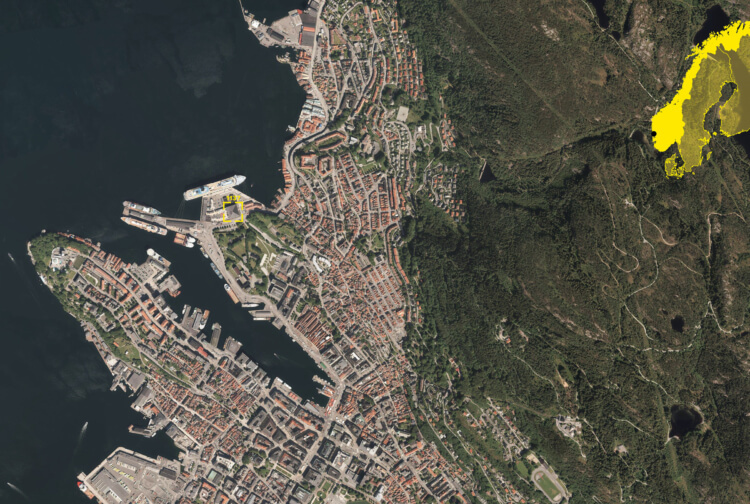 This will contribute to an area that is perceived safer and will work better as a transition between the environment around the harbor and the local communities in Skuteviken and Sandviken. The building component has a surface area of 45×50 meters and a height of 26 meters above the general ground level; 7 floor plans including one floor with double height. With such a deep building mass, there arises a clear need for additional daylight than what an ‘open’ glass or window facade can do alone. In this context, the classic vertical light shaft was “challenged”. Access to all floors is thought to go through a displacement in the light shaft, and one moves through a varied interior landscape from a new entrance in southeastern corner of the bottom floor to the top floor at the building’s northern and middle parts. Up here you will get views of the fjord. The light shaft remains within the block’s façades, and will thus not be a visible form from the outside. The historical form of the building has not changed. But to achieve usable areas for office and service functions, the building is covered with perforated aluminium plates that give the building a distinctive pattern. This gives the building a decorative touch, which both works for sun protection and prevents sunlight reflection and unnecessary visual noise for the historic fortifications as its nearest neighbour.